I am all about the lip products lately. Frankly, anything that keeps my lips hydrated and moisturized gets an A in my book. But at the top of my list? Definitely The Body Shop Papaya Lip Butter. While sitting at the airport recently for my trip to L.A. for the Total Beauty Summit, I -- gasp! -- realized I had absolutely no lip balms in my purse. A travesty, I know! Luckily, the Newark airport's Continental terminal is graced with The Body Shop. So I sauntered in, hoping to find a lip balm at a reasonable price. I was completely awed, shocked and amazed at what I found! There were three different displays dedicated to lip balms of various shapes, sizes and flavors, each one smelling more fantastic than the next. Mango, Coconut, Almond, Passion Fruit, Pink Grapefruit, Strawberry ... it was difficult to choose, but I finally settled on Papaya -- a sweet-smelling tub that I must admit tastes delicious too! The butter is formulated with tons of elements that help to keep your lips soft and supple. Papaya seed oil, shea butter and organic beeswax all moisturize and soften, while Vitamin E conditions, nourishes and protects your precious pucker. I've been astonished every time I rub this baby on my lips -- it seriously keeps them softened even while I'm sleeping! Unfortunately, this flavor is no longer available. 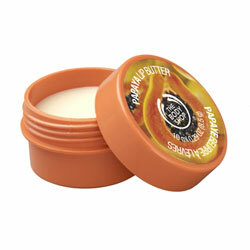 Find other flavors of The Body Shop Lip Butter for $8 each at thebodyshop.com. Thanks for visiting my blog, hope to see you around more often =). Anyways, I've heard about Body Shop's body butters, but never knew it came in a lip form. It would be even better if it was in chapstick type of packaging, it would be more hygenic.